The iPhone XS, iPhone XS Max and iPhone XR have arrived and all come with a Notch that we already know from the iPhone X. As a developer it is your responsibility to adjust your Air app accordingly to make sure you have a safe area at the top and bottom of the device. Because if you don’t, the Notch will cover your UI at those areas. First, make sure that your app will be able to render at the native resolutions of the new iPhones. If you don’t request the native rendering resolutions of the device, the new iPhones will fall back to use the resolution of older devices that you support and add black bars on the top and bottom of your app. Technically that makes no problems, but the black bars prevent your users from getting the most of your app. Also, Apple will not allow you to release updates of your apps until you use the complete screen for your app and support the Notch correctly at full resolution. At the time of this writing, no splash screens for iPhone XS Max and iPhone XR are supported by Adobe Air, meaning we will have to wait until Adobe releases an update. If you have already released an update of your app recently then chances are that you already support the iPhoneX resolution with the correct splash screen. That means without any further change, your app will also run on the iPhone XS in native resolution right now, because iPhone X and iPhone XS share the same device resolution. In our case that was a problem because in our code we activated the Notch logic based on the deviceModel. 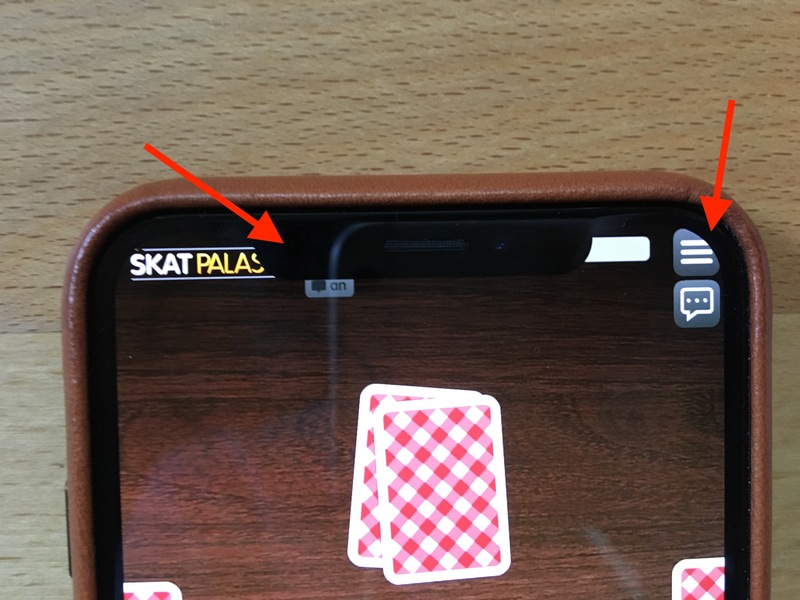 But we did not handle the Notch for the iPhone XS correctly, because when the code was written, the iPhone XS did not yet exist. Since the app already requested the native resolution of the iPhone XS but did not activate our Notch code adjustment, the UI was covered by the Notch and breaking the user experience. To correctly adjust our code to support Notch rendering logic, we are checking for the deviceModels and activate the code accordingly. Check for these device models and update your rendering accordingly. The deviceModel information is not available in Air by default, but you can use a native extension to retrieve it, for example this one. Here is a code example of how to set the correct paddings in your application for a Notch device. That means no buttons or other important content should be inside the safe area. Please note that the above is Haxe code, but it should be easy to adjust it to Action Script 3. The viewport in our case is a class that holds information that tells the app where to render the content on the stage. You will have to add a similar logic to your code by yourself. 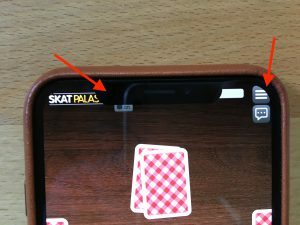 On the current generation for all iPhones with a Notch, the top safe area is 88 pixels and the bottom safe area (where the iOS swipe bar is located) is 68 pixels. In our app, we use a top padding of 88px and a bottom padding of 68px in portrait mode, and a left padding of 88px, a right padding of 88px and a bottom padding of 68px in landscape mode. Now you need to call this function on startup and whenever your device rotates. That way you calculate the proper padding for the current orientation. Obviously the behavior is different, depending whether the device is running in portrait or landscape since the Notch rotates together with the device. Of course the tricky part is how your application will keep the content inside of the padding. But this is your job as a developer and there is no one fits all solution. You will have to make sure that every screen and every scene of your app will respect this padding and not render below the Notch or the safe area at the bottom of the device. If you happen to have a server that your application connects to, I would recommend that you send the deviceModel on startup to your server and send the Notch data back to your client. That way, your app will be future proof and you can add new devices on the server to handle the Notch without updating your clients whenever new devices with a Notch are released. 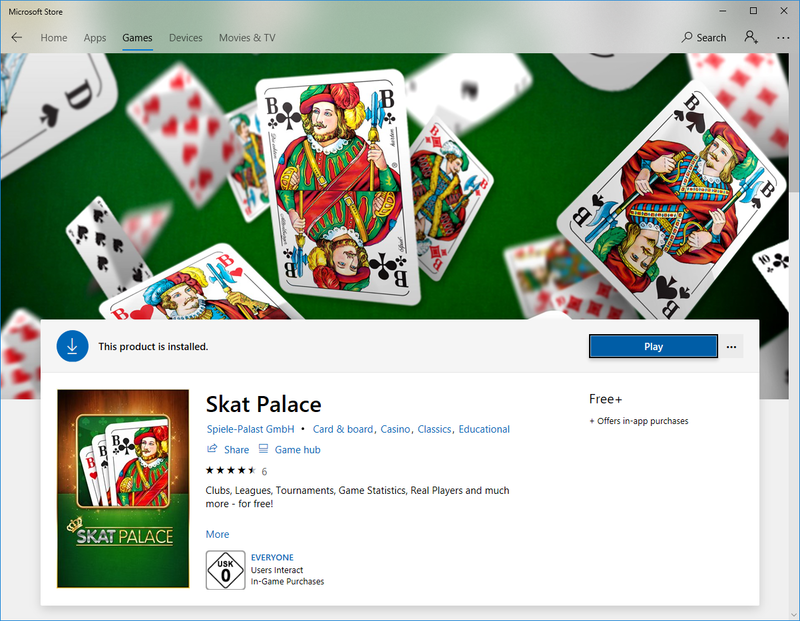 We have recently released our first game for Windows 10 on the Windows store, including in-app purchases. Since there are only few resources available how to convert an app to a Windows Universal Package (UWP), especially from an Air perspective, I want to share a step-by-step guide. This first part will cover the conversion of a generic Air app to the Windows store. 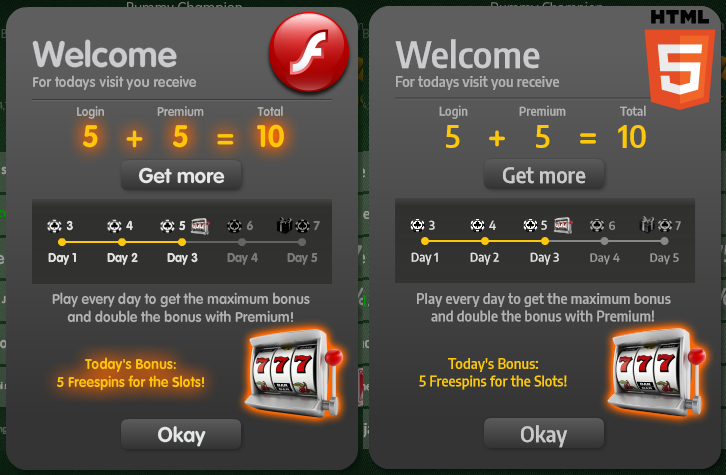 I plan to write a second part that explains how to include in-app purchases, since that part is quite complex. Now take a deep breath, it’s time to get your hands dirty. Note that the adt call references the Air configuration file “application.xml” that you should already have. Furthermore, we include -extdir “..\_extensions”. The extensions directory is only required for Adobe Native Extensions (ANEs) that you might not need at this point, so you could remove that part. However I will keep this for reference since we will need it in the future when adding Store payments. With this call, adt should convert your app into a a standalone Windows project that should run when opening the .exe file. If you already have an Air app for Windows that you offer to your customers, chances are that you also have an installer file that will setup your app or game on your clients’ computer. You can use this installer with the Desktop App Converter. Alternatively, we can directly target the Air output without using an installer file. More on this later. We have chosen to work with Inno Setup but there are a number of free alternatives available. I have not tried other options, so the decision is really up to you. The installer should include all files and subdirectories that are inside the “air/install.air” directory. Reserve some time for this step and test your installer carefully before you continue, ideally on systems that have never seen your project before. This will make it easier to spot errors before you scratch your head over why the Windows Store build does not work correctly. Make sure that all dependencies are correctly installed and also removed when uninstalled. Creating installers is not a no-brainer, so don’t expect this to be done in 5 minutes. Now is a good time to create your app entry in the Windows Dev Center. This can also be done at a later time, but it will give you access to some info that is referenced in the conversion process if you want to release the build on the store. If you skip this step now, you can use debug info later in the process until you are ready. When you are signed in, click Dashboard on top to access the Partner Center. If I remember correctly, this step involves some verification process by Microsoft, but it is so long ago that I don’t remember all the details. Feel free to comment on this so I can include it here. Once you are ready and a verified partner, you should be able to create a new app. With the app entry created, find the “App management” tab and click “App identity”. This list includes some values that we can use for the conversion process. The next step is to actually convert your app into a Universal Windows Platform (UWP) .appx package. Please note that despite the name, it will only work on Windows 10 for PC. Before we can start, we need to install and setup the converter. Download the Desktop App Converter through the Microsoft store from here. Next, download the correct image file from here that is needed to initialize the converter before you can use it. The image file version number should match your Windows build number that you find via Windows Settings -> System -> About -> OS build. This might involve a system restart. If you require additional help, the official Microsoft documentation that this part of the blog is based on can be found here. Your converter installation should now be ready for use. Conversion time, finally! Before we start, I would like to give some folder structure recommendations as follows. Create a new folder on your hard drive where you plan to keep your conversion files in. In this folder, create a readme.txt file where you can paste all the handy commands that we will use, since you will need them every time you create a new version. Also in that directory, create a folder called “builds” that will contain the converted app or apps. Using this subfolder will allow you to exclude it from git to save bandwidth. Depending on whether you have an installer for your Air application or not, one of the two option applies. In both cases, make sure you are running the Desktop App Converter as an admin, then paste the commands into the console window. For the three values that reference the App Identity from the Windows Dev Center Dasboard of your app, you can use some default values until you plan to ship the product. For example -PackageName "My Great Game" -PackagePublisherDisplayName "Best Company". -PackageArch "x86" is required in our case, but might differ if you build an Air app with 64 bits support. The directive -InstallerArguments "[ARGUMENTS]" depends on whether your installer needs arguments to run in silent mode. In our case we use -InstallerArguments "/SILENT /LOG=[SOME_LOG_PATH].txt"but maybe you can skip it altogether. The first time that you run this command the converter will make sure that all required settings are activated. There is a virtualization feature that needs to be turned on and there is a chance that your computer does not even support it. At least in our case one of our machines could not run the converter and we had to use a different system. Anyhow, if that problem is solved and your system has been restarted potentially a couple of times, you should now find an .appx file in your [TARGET_PATH\builds\PACKAGE_NAME] directory. The converter automatically created a subfolder in the builds directory with the Package Name of your app. In this folder you find the .appx file along with a certificate and other resources. Unfortunately you will have to install the certificate every single time you want to test a new version of the .appx. Double click the auto-generated.cer file. Then click “Install certificate”. Next choose “Local Machine” and confirm administrator access. Next choose “Place all certificates in the following store” and click “Browse”. Here choose “Trusted Root Certification Authorities” and click “OK” and then “Next”, then “Finish”. It’s no joke, you have to do this every single time you create a new version and want to test it. If you don’t, Windows will not allow you to install your .appx package. Now you can double click the .appx file and Install your app on the system. In subsequent conversions you need to uninstall the existing version of the .appx first. Do this by searching your app in the Windows 10 search bar, then right click and Uninstall it. Only then the new version can be installed, otherwise it will just offer you the option to start the already installed version. 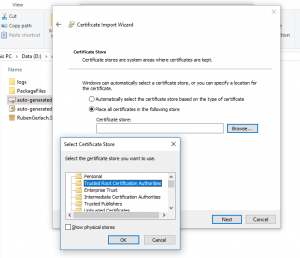 If you happen to own a code signing certificate already, or you feel installing the certificate 50 times a day is worth buying one, you can skip the manual installation of the auto generated certificate by using a proper certificate from a verified authority. Please note that this only works during development and that you can not ship the .appx to Microsoft with a custom code signing certificate. The .appx that you have now should technically be ready to be released on the Store. 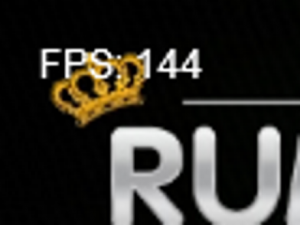 However, the icon assets that the converter produces look really bad. Don’t you worry, I got you covered. If you haven’t, yet, it is time to install Visual Studio from here. Now a couple of head scratches later, you should find the Visual Studio entry in the Windows 10 Start menu. Don’t open the executable, instead open the Visual Studio subfolder. Inside there should be the “Developer Command Prompt”. Run it to find another console window. If that was successful, you will find a new folder in the builds directory that includes all files that were contained in the .appx. Go inside and into the Assets folder. It contains a number of images that all look very blurry. Go back and copy the Assets folder as a whole. Then navigate to the root of your conversion folder and create a new folder called “_assets-[APPNAME]” next to the “builds” folder and paste the Assets folder inside. We will later store more files than just the Assets subfolder inside it, so don’t just copy the Assets folder next to builds. It is now time to replace the contents of all the .png files in the “_assets-[APPNAME]\Assets” folder with your high quality custom icons. Of course make sure that you do not accidentally change the dimensions of any of the images. This process will take a while and that is why we store a copy of the polished icons outside of the builds folder, so we can copy it quickly next time you release an update. In the past, Microsoft did not allow icons over a certain file size and this size limit was easily triggered. So in case that happens to you, Adobe Photoshop has a nice feature to save PNG files with 8 bits by preserving highest quality of content. But I haven’t seen the error with recent updates of the converter even without compression. When you are done, copy the “_assets-[APPNAME]\Assets” folder into the unpacked .appx folder and override the blurry icons. Confirm to overwrite the existing .appx file and find the updated package in the builds folder. Unfortunately, the Desktop App Converter creates English only packages by default. Here is a small guide to convert your app into a multi-language application. Navigate to the _assets-[APPNAME] folder and create a new folder called “Strings” next to the existing “Assets” folder that you put there in the previous step. In the Strings folder, create new folders for each language you want to create by using the ISO-Standard in lower case. In our case that means “en-us” and “de-de”. Again, we are storing the Strings folder for reference here. Now copy it into the unpacked folder of your .appx where you also copied the Assets folder. Next we need to reference the translations in the project. In the unpacked project folder, find the manifest file called “AppxManifest.xml” and open it. Here we need to replace the hard coded strings with variables that reference above language files. Save your changes and copy the file into your assets directory, next to Assets and Strings for future reference. Notice that when you copy the manifest file over the converted one, this will override the version number, so you have to change it manually each time, because the Store will not allow you to upload the same version number twice. One final step is required to make multi language work, because the new String resources are not yet registered in the project. We now need to create a new .pri file that organizes the project resources based on the resources of the unpacked app. Navigate one level up into the builds folder and you should find a number of files, including the desired resources.pri file. Delete the other files that are no longer needed and copy the resources.pri into the unpacked .appx folder as well as into the assets folder next to the AppManifest.xml for future reference. The .appx you have at your hands now should be good for release. Navigate to the Windows Dev Center Dashboard and select the app you have created earlier. Next, start a new submission, if you haven’t already. A submission is basically a version of your app, including it’s presence on the store. In this submission, navigate to packages and drag and drop your .appx file into the upload field. Uploading the .appx will check for various errors, for example Publisher name, Package name, asset file sizes and so on. So expect some problems and dedicate some time to fix them the first time you do this. Before you can release the app to production, Microsoft will ask you to send them a small report about your app. 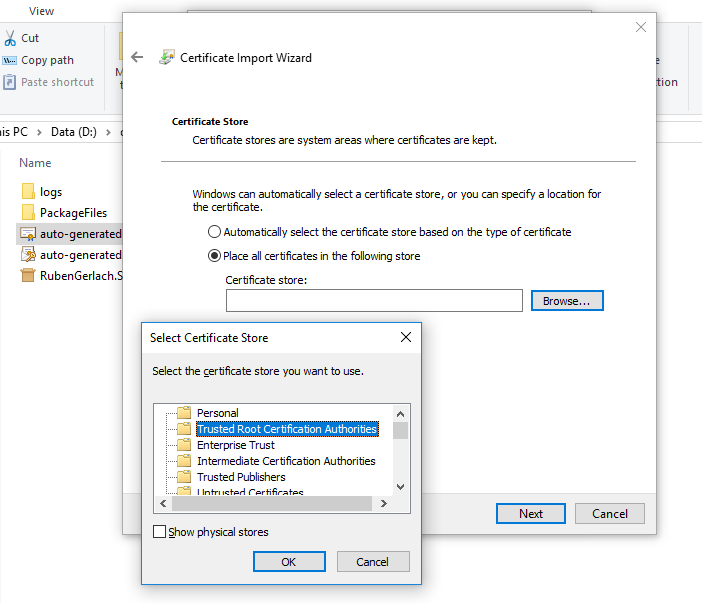 This will include results from the “Windows app cert kit” that is included in the Windows 10 SDK and answering some questions about your product. This step will take up a couple of days, so plan ahead. Once all of that is done you should be able to finalize your Windows Store presence, including description, screenshots and so on. Hit the “Submit to the Store” when everything is ready. From here it should only take a couple of days until your app is live and available for users on the store. It is worth noting that Microsoft will not allow remote updates from within the .appx application by downloading swf files from a server, even though it is technically possible to do that. Our app was rejected for this reason when it showed an update mechanic. That means the only way to provide a new version to your users is by submitting a new .appx through the store. I hope this guide is useful for anyone interested in deploying Air for Windows Store. If you think this was complex, wait until we have a look at in-app purchasing. In any case let me know if you face any problems during the process, if something is unclear or if I missed to cover important aspects. If you worked through the guide and have released something, please post a link here so I and other Air devs can check it out, I am always curious to see what other people work on.